Resource center Drug Recovery Process and Timeline What Are the 12 Steps of Addiction Recovery? According to the 2014 National Survey on Drug Use and Health (NSDUH), about one out of every 12 adults in the United States struggles with problematic alcohol and/or drug use and addiction. Addiction is a complex brain disease that impacts people emotionally, physically, socially, financially, behaviorally, and personally. Families and loved ones are negatively affected as well. Addiction recovery is aided by professional treatment programs and by engaging in support groups that can offer encouragement, hope, and healthy peer interactions. These self-help groups aid in facilitating the formation of groups of people who have similar goals for sobriety and long-term abstinence from drugs and alcohol. The idea of a 12-Step program began with Alcoholics Anonymous, or AA, a program designed to support individuals struggling with addiction to alcohol in their recovery efforts. Alcoholics Anonymous is free and open to anyone battling alcohol addiction who wishes to remain sober. Meetings take place all over the world in at least 181 countries, and there were more than 2 million members of AA at last count in 2015. Over the years, other organizations have been formed to support recovery for all types of substances, not just alcohol; groups include Cocaine Anonymous (CA), Narcotics Anonymous (NA), Marijuana Anonymous (MA), to name a few. These recovery support groups tend to follow the general 12-Step ideology as outlined by AA, which is highlighted below. Individuals are encouraged to work through the steps one by one, with the end result being to maintain sobriety, achieve a spiritual awakening through these steps, and then carry the message on to others battling addiction. As defined by the American Society of Addiction Medicine (ASAM), addiction is a disease that disrupts brain chemistry and circuitry, which in turn impacts willpower, reward, memory, and motivation. The first step calls for individuals to accept that they are unable to control their drinking and/or drug use and that their willpower and motivation have been compromised. When someone struggles with addiction, they are no longer able to manage how much and how often drugs and/or alcohol are abused. Recognition of this loss of control and admission of being powerless over addiction is the first step toward recovery. AA is a spiritual organization that calls for people to believe in a higher power and to accept God as they understand him to be. God, or a higher power, can come in many forms and does not have to be taken in the traditional sense. What Step 2 calls for is faith that a higher power exists and that this power is necessary to restore sanity. For those who don’t believe in God per se, this higher power can represent any number of other things, like the stark reality that recreational drug use is unrealistic. Many 12-Step groups exist for individuals who are uncomfortable with the religious nature of traditional AA, such as AA Agnostica, which is designed for atheists and agnostics. The goal of Step 2 is often taken to be more spiritual in nature than religious, as it asks each individual to accept that they require help from something greater than themselves in order to move forward in recovery. Each person will have their own idea of who or what the higher power is to them, and in Step 3, individuals are asked to turn their lives over to this power for healing purposes. Steps 1 and 2 are all about reflection, learning that alcohol (or drugs) is a driving force in life and that a higher power is needed to recover and remain sober. With Step 3, individuals are called to action and to a willingness to change moving forward. The Serenity Prayer is learned, which is meant to be used whenever individuals need a reminder in their lives. The Serenity Prayer is as follows: “God grant me the serenity to accept the things I cannot change; courage to change the things I can; and wisdom to know the difference.” This prayer is considered a cornerstone of many 12-Step programs as it embodies the idea that individuals need to accept the control that alcohol and drugs have over them, gain strength to work at remaining sober, and know when things are changeable and when they are not. Step 3 asks individuals to be willing to let God, in whatever form that is for each person, fully into their lives. This inventory of self is meant to be comprehensive, searching, and fearless. This does not mean that it is without fear, but that individuals are encouraged to push past their fears and be honest with listing their shortcomings. Writing lists is often an important part of Step 4 as individuals are called to cite incidents, thoughts, feelings, and past experiences that may be difficult to think about. In Step 4, individuals are asked to be thorough and honest in their personal inventory, writing down anything that comes to mind, and then to explore the effects and particulars of each incident. Self-reflection and introspection into how each event may have impacted family and loved ones as well as individual feelings are delved into during this step. People may wish to start a personal journal. This inventory during Step 4 can take some time to complete. Individuals may therefore spend a lot of time on Step 4, writing, praying, and receiving encouragement from others in their support group. During Step 5, individuals will choose a trusted person to share personal stories and events recorded in Step 4 with. Individuals are asked to confess their shortcomings to their higher power and ask for forgiveness. Step 5 is often considered the confessional step and should follow Step 4 fairly closely. During Step 5, a trusted support person should be selected, after sins are confessed to the higher power, who can help individuals to move forward and leave the past behind them. Addiction can be isolating as individuals shrink into themselves, and Step 5 is often the first step toward opening up to others. It can be difficult to admit to oneself any wrongdoings and even harder to then share them with others. During Step 5, individuals are often humbled and then feel cleansed moving forward, leaving negativity in the past. Step 6 is about letting go of negativity and the past, and moving forward with the help of the higher power. Individuals pray, asking their higher power to remove their moral failings. People may go back to their lists of wrongdoings during Step 6 or choose to write a whole new list of specific character flaws. Individuals then choose something positive to replace these defects with. For example, lying and secrecy can be replaced with transparency and honesty. During Step 6, it may be helpful to write down several positive affirmations next to personal character issues, thus providing new and healthy methods for living in recovery. Humility is the key of Step 7, as individuals are asked to seek God’s will in how their life is to be lived. Humility is defined as the state of being humble or thinking less of oneself than of others. Humility is an important concept in recovery. Meditation is often useful during Step 7 as a method of self-introspection and learning how to apply humility to one’s life. During Step 7, individuals work to remain humble. Step 8: Listing Wrongs and Becoming Willing to Make AmendsDuring Step 8, people commonly resort to writing lists again, and this step is about forgiveness. Often, two lists are formed during this step: The first is a list of those who the person needs to forgive and the second is a list of those from whom they need to seek forgiveness. There will likely be crossover people on both lists. Individuals are encouraged to be honest and write down names of anyone who elicits strong emotions like resentment, shame, guilt, anger, fear, etc. Addiction can be far-reaching, and individuals should be thorough in their list, as no small slight should be overlooked. Individuals are asked to think about anyone whom they may have harmed, either through direct or indirect actions related to their addiction, as well as to release themselves from past resentments and anger. Step 8 continues the moral inventory, taking it further to include specific people impacted by the disease of addiction. Step 9: Making Direct Amends When It Is Not Harmful to Do SoDuring Step 9, individuals will attempt to make amends for wrongdoings done to specific individuals. People are encouraged to reach out to these individuals and let them know that they would like to approach them to make amends. It can be very humbling to do so. In some cases, it is not possible to have these conversations directly, or doing so would be more harmful, so indirect methods may be ideal. Individuals can write a letter to the person (even if it will never actually be delivered), or they may choose to donate to a charity in their honor or help someone else in need. With Step 9, individuals are apologizing for their actions while under the influence of drugs or alcohol or for the damages their addiction has caused. Individuals may then attempt to offer restitution and seek forgiveness and reconciliation but need to be aware that they may not receive it. Working through Step 9 helps to set things right so everyone can move on. Steps 1-9 set up a strong spiritual foundation and a new way of life without drugs and alcohol. With Step 10, individuals are seeking daily accountability for their actions. Recovery is ongoing, and individuals continue to examine how their thoughts, words, behaviors, and actions impact daily life and how to keep themselves in line with their faith and God’s will. Individuals are asked to take inventory every day and immediately correct any wrongs that are apparent. This may be accomplished by keeping a journal or devising another method of self-examination each evening, for instance. By understanding how certain things may make a person feel and therefore act, individuals can become more aware of themselves and their behaviors. Step 10 involves personal reflections and a kind of spot-checking to keep oneself balanced emotionally. Step 11: Praying to Improve Contact with God and Carry out What Is RightMeditation, prayer, and journaling make up Step 11 as individuals use these tools to form a spiritual connection with God or the higher power. Quiet time and solitude provide for self-reflection, and meditation can be helpful to increase the connection between the body, mind, and soul. When a person is in tune with themselves physically and emotionally, the spiritual aspect is also strengthened. Journaling during Step 11 can be a beneficial way to explore thoughts and emotions more fully as well. Step 12: Experiencing a Spiritual Awakening and Carrying the Message to OthersThis final step is the service aspect, and it asks individuals to give back to others who are also struggling with addiction. After coming to God or a higher power, individuals are then taught to share this spirituality with others and support them in recovery. During Step 12, individuals are often asked to share their stories, testimonies, and struggles with others in order to provide hope and encouragement. 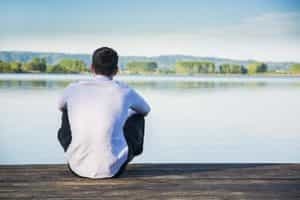 At any point, individuals may choose to go back and revisit any of the steps in the 12-Step program even if they have already worked through all of them previously. Different situations may require reflection or a look back at one of the steps. Programs like AA and other 12-Step groups provide a healthy community of support and solidarity filled with individuals who are all seeking to remain sober on a long-term basis. Individuals who regularly attend AA meetings are about twice as likely to remain abstinent over those who don’t, per the Journal of Addictive Disorders. The 12 Steps can go a long way in providing individuals in recovery with the support they need.